Are you a woman who loves to race? Well, the Specialized Amira might be the perfect bike for you. It is made for all the women out there who want to show themselves the meaning of speed, with a gorgeously compact frame and some of the best specialized manufacturing processes in the making of the bike. The price of the Specialized Amira line told us that this was a series of bikes made for mid-range buyers who wanted to race. We felt the stiffness of the full carbon frame along with the nice price bracket the bike nestled in. Overall, however, we also noticed that the groupset of the bike wasn’t the best out there; it was actually pretty average. 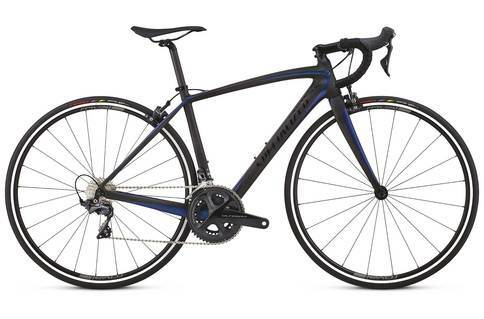 For some reason, it used the Shimano 105 set instead of the Ultegra set that so many similar bikes have on them. In addition to this, the lack of internal cable routing led to the frame looking a little messy. When we took the bike out on the street, we expected the performance to be pretty average too, but we were wrong. While it is a relaxed ride as opposed to an aggressive one, it is able to sprint with ease and precision, with the stiffness of the frame increasing power transmission by a large amount. Perfect for a casual racer. Made for a woman to have the time of her life on, this machine is bound to give you a fast, efficient and powerful ride, although it doesn’t look it on paper. We didn’t really notice the lack of great components when we took the Specialized Amira out for a spin. It was quick, nimble and very relaxing at the same time, so we thought it was a pretty solid bike overall.